The name “E-Bugster” is a combination of “E” for electric, “Bug,” the American nickname for the Beetle, and “speedster,” which typically describes an open-top two-seater. 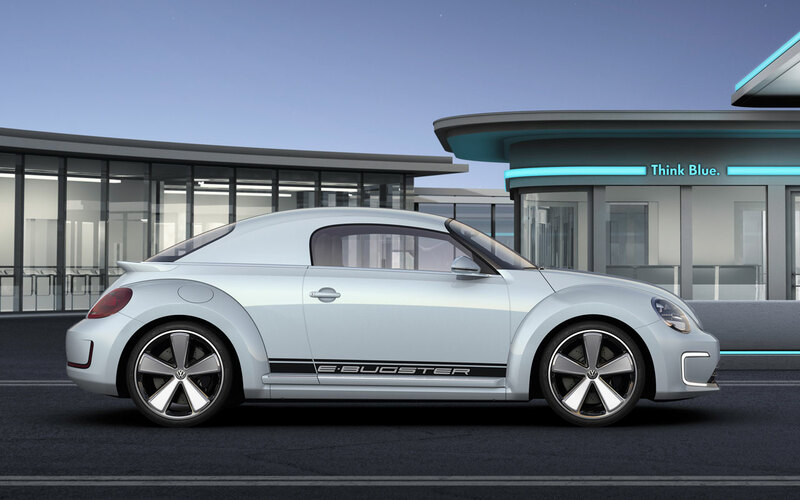 Although the E-Bugster concept is clearly not a convertible, it sports the typical speedster profile of shallow windows and a low, dramatic roofline. 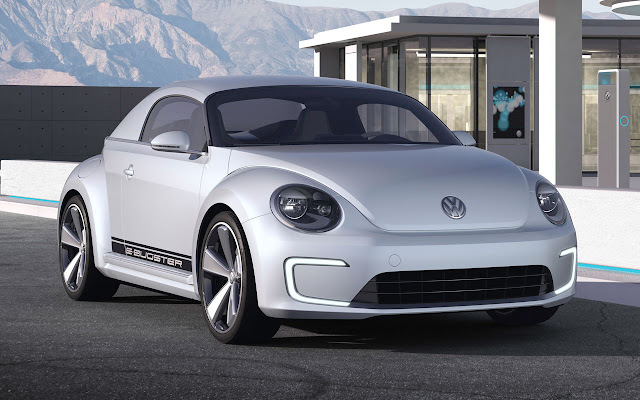 At the heart of the E-Bugster is an electric motor that makes 114 horsepower (85 kW) and 199 pound-feet of torque. A lithium-ion battery enables the car to go more than 100 miles in zero emissions driving. Stored under the trunk floor and the rear bench, the battery weighs 695 pounds. The battery is recharged via a plug interface located on the car’s passenger-side rear fender and can accommodate all three types of available chargers: Level 1 (120V), Level 2 (240V), and, where available, Level 3 (quick charge, 80 percent charge in 30 minutes). 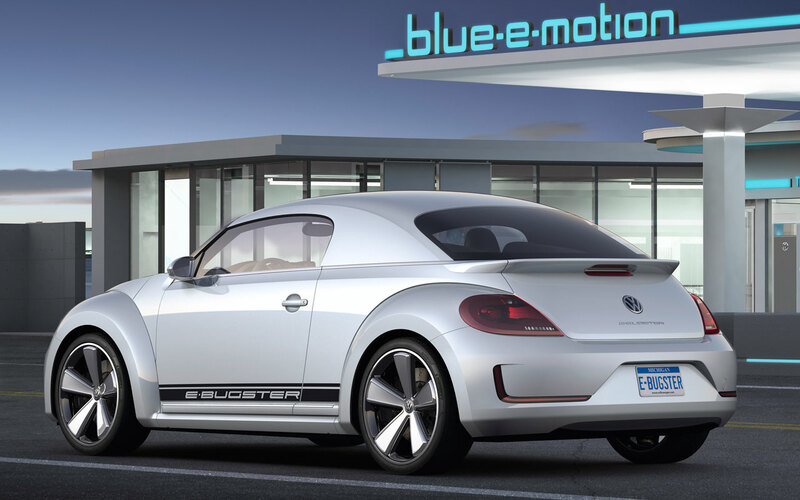 Holistically, Volkswagen calls the electric drive unit used in the E-Bugster “Blue-e-motion,” and it will be found in future products such as the Golf Blue-e-Motion. 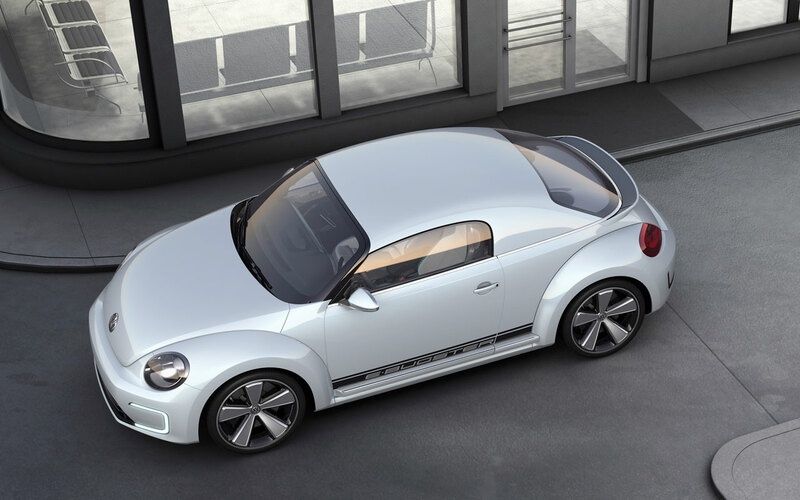 From the side, the E-Bugster’s low, flat roof serves to frame the rest of the vehicle’s distinctive features. Between its flared fenders and 20-inch wheels, there’s a distinctive Beetle “V” that runs along the side of the vehicle. Above its side sill, a decal with the “E-Bugster” signature can be seen. Just above this point, the chrome has been lengthened from the lower window border towards the rear of the car. The top of the E-Bugster extends in a flat arch over this chrome line and borders the vehicle’s side windows. The height between the chrome lower edge of these windows and the uppermost roof line is tight, like a chopped-down speedster. Overall, the Bugster is nearly three inches lower than a Beetle.